Reviews in the Endoscopy Essentials series cite publications from the past year which, in the authors’ opinion, reflect the state-of-the-art in endoscopy. Alongside a short summary of each paper, authors explain why they consider their selected articles to be of importance. 11 Ruff CT, Giugliano RP, Braunwald E et al. Comparison of the efficacy and safety of new oral anticoagulants with warfarin in patients with atrial fibrillation: a meta-analysis of randomized trials. 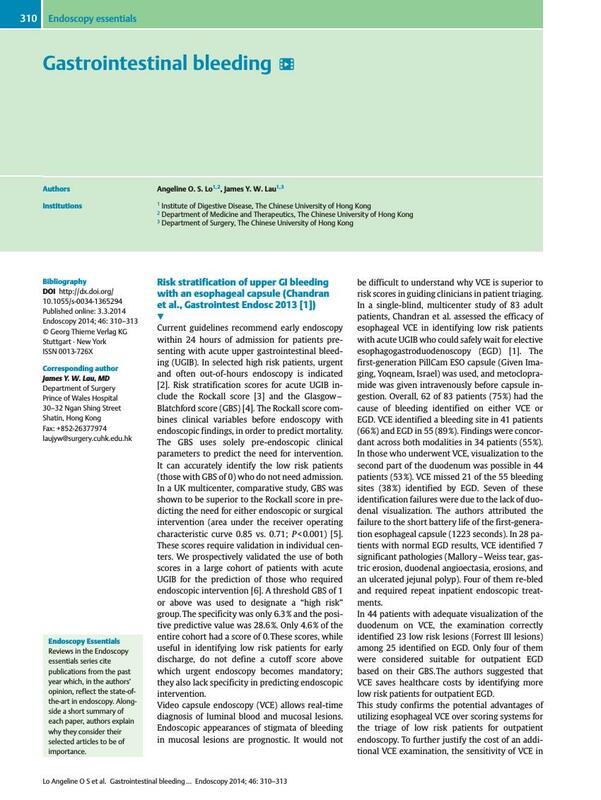 Lancet 2013; [Epub ahead of print] DOI: 10.1016/S0140-6736(13)62343-0. 23 Mönkemüller K, Peter S, Toshniwal J et al. Multipurpose use of the ‘bear claw’ (over-the-scope-clip system) to treat endoluminal gastrointestinal disorders. Dig Endosc 2013; [Epub ahead of print] DOI: 10.1111/den.12145.